In 2006 we decided it was time to start looking for an offroad capable vehicle that could take us out to remote campsites while still providing a level of comfort. Somehow we were foolish enough to believe that we could combine the needs of the expedition vehicle with the needs of a luxury car suitable for use in our real estate business, so we started the research process. After evaluating everything from the VW Tuareg to the Range Rover, we decided the Lexus GX470 fit the bill perfectly. It was elegant and rugged at the same time, having been named “Offroad Vehicle of the Year” by a 4×4 magazine a couple of times. It’s kind of like when people describe a forest cabin as rustically elegant. Trail driving performance was astounding as the truck floated over washboard roads at blinding speeds as if we were floating on a cushion of air. In Jan 2007 our friends Brian and Anya from Encinitas and us decided to connect trails in Anza Borrego State Park from south to north for a multi-day mini expedition. Things were going great until we reached the Diablo Drop-off, where we found ourselves in way over our heads for a luxury vehicle with $3000 bumpers and running boards illuminated by pretty lights. Many harsh words were exchanged during that stressful section of trail and we reached the conclusion that we loved overland travel and that it was impossible to meet our expedition needs and business needs with one vehicle. Thus, after just a year of ownership, the luxurious and rugged GX470 went off to its new home in Toronto and we were in the search for a replacement. For price reasons, we considered the venerable Jeep Cherokee but ultimately decided that it just doesn’t offer the quality that we wanted. Ultimately the choice became very clear. 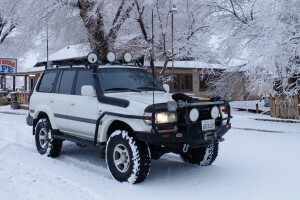 We wanted the ultimate of the vehicles that mark the pinnacle of overlanding capability and that meant the awesome 80 series Toyota LandCruiser. 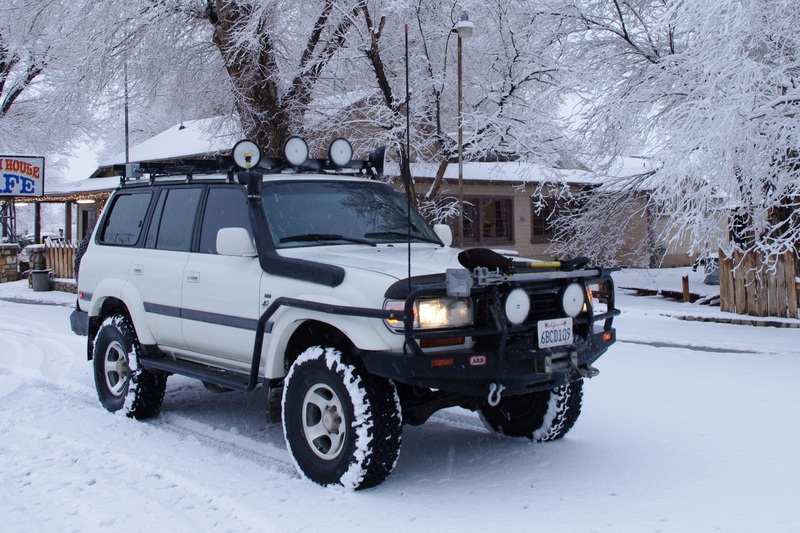 The desire to find a vehicle that offered the ultimate combination of safety, comfort, reliability, and capability, we were limited to just the 1996 and 1997 model year LandCruisers with a very rare factory option of locking front, rear, and center differentials. Those years offered the luxury of full leather interiors and power everything along with the rugged capability and performance of solid, coil spring front and rear axles and the safety of ABS brakes and dual airbags. The pool of potential vehicles was extremely limited to begin with but we has some goals that limited the search even further as we wanted a 40th Anniversary or Collector’s Edition LandCruiser in white with low miles, perfect interior, already offroad modified, from a rust-free part of the country AND we wanted to buy from an original owner. Phew! That was an impossible list. After about 6 months of searching, Markus came across an eBay listing in Miami for just such a vehicle. We couldn’t believe our fortune and were worried that it was too good to be true. Markus contacted the owner and negotiated a price. The owner was so certain that the truck was as perfect as he advertised that he agreed to buy Markus the return flight if there was one single flaw in the vehicle. So, Markus purchased a one-way ticket in October 2007 and flew to Miami. The moment Markus saw the truck parked in the driveway of the owner’s house he knew this was worth the flight. It had been purchased new in April 1998 with 9 miles on the odometer and lovingly cared for ever since. One of the last 80 series LandCruisers to sell in the US, this white Collector’s Edition was incredibly special. The owner had immediately installed waterproof seat covers and rugged rubber floormats and left them in place from the beginning. The paint was nearly perfect, the carpet and interior spotless, and the leather so smooth and supple that it looks no more than two or three years old. The modifications were exactly what we wanted, there was nothing added on that we didn’t need, and with only 132,000 miles, it was practically new. Our latest set of plans for the expedition setup include an offroad trailer to enable us to travel and “glamp” anywhere in rustic elegance and rugged luxury. We currently have a 2004 4x4Trailers offroad trailer with many modifications including onboard water tanks with pressurized hot and cold water and Maggiolina roof top tent. Plans are underway to sell the trailer and custom build an offroad teardrop trailer. More on that when the time comes.